To win a game of poker, you must have a better hand combination then your opponents. Obviously the best card combination which a player can receive is the Royal Flush. 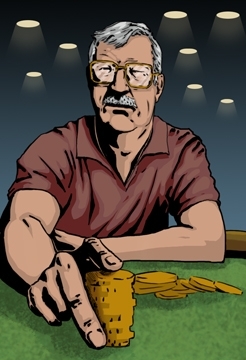 This combination is the highest possible hand, but has odds of 649,739/1 of being achieved. These odds show why there is a certain amount of luck involved. To win a game of poker, you have to have a better hand combination then your opponents. Obviously the best card combination which a player can receive is the Royal Flush. This combination is the highest possible hand, but has odds of 649,739/1 of being achieved. These odds show why there is a certain amount of luck involved. Knowing when to fold ’em and bet sizing are the two biggest errors I see tournament players make.